The concert hall at the Syndey Opera House holds 2,700 people. This blog was viewed about 27,000 times in 2011. If it were a concert at Sydney Opera House, it would take about 10 sold-out performances for that many people to see it. It has been a few years since that first, glorious, six-month trip around and across Australia. However, as soon as I had gotten my new writing career off and running, I headed back. I can’t stay away for too long. I do realize that part of the magic is that in Australia, all I’m doing is traveling — no job, no housework, just get out into the wilderness and immerse myself in the beauty and wildness of this remarkable land. But that is not the only thing, because I have vacationed many other places, and nowhere else has really captured me the way Australia did. So I keep going back. Some things have changed. I note in my book that we could see the markers in Kakadu showing that things were scheduled to be “improved.” They have been. There is a hotel now at Cooinda where I had slept so peacefully beneath the stars. Boardwalks have been added in a few of the places in the Red Centre where we had to scramble and climb. The cities are bigger. And yet the things I love about Australia remain unchanged — primarily, the ease with which one can escape into the wilderness. I have returned to the rainforests, to the rugged coasts, and, of course, to the outback. I’ve seen places I promised myself for “next time,” and returned to places I love. Soon, I’ll begin recording those return trips, with photos and tales gathered on each adventure. Before then, I want to share a few bits of Aussie culture that I found delightful — music, poetry, history. Now, however, I’ll just mention a few more changes — ones not mentioned already in posts on this blog. The contents of the Geological and Mining Museum that I loved so much in Sydney have all been transferred to the Power House Museum. So if you look for the museum I named, you won’t find it, but you can still find the wonderful minerals and displays of gold history. The place in the Argyle Center where I bought the golden wattle perfume has closed. I have found other perfumes that call themselves golden wattle, but never again one that smelled so perfectly like the wattles blooming in the mountains. On the other side of the continent, in Fremantle, the convict-era prison was at long-last decommissioned, and it is now a museum. The food scene, while great when I first visited, keeps on improving. Australia never had a shortage of great eating options, what with the ocean so close at hand for most of the country, the warm weather offering glorious year-round produce, proximity to Asia and a migrant population contributing to the wonderful variety, and wine regions just about everywhere one turns. But since that first trip, more and more up-scale places have opened, and Australia is now a major foodie destination, with truffles and wagyu beef, and cutting-edge chefs taking advantage of all that land and sea have to offer. In fact, my second trip back, it took a bit of effort to find a humble meat pie — but I did succeed. The cities are still handsome, and most offer delights not available on my first trip. However, most of what I enjoyed is still there, from the historic buildings to the great zoos, museums, and galleries to the ethnic diversity to the open-air markets. 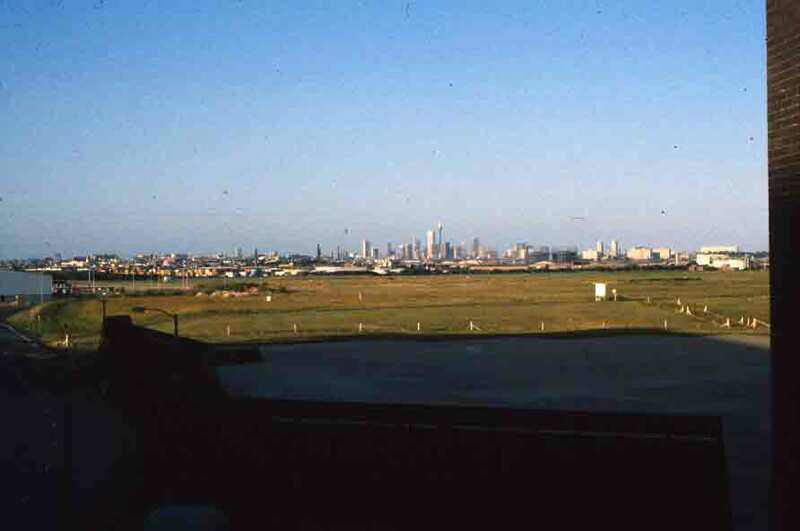 The photo below is of Sydney from the Kingsford Smith Airport. The saddness or sweetness of the view depends on whether you have just arrived or are departing. When I took this photo, I was leaving. It was the end of my first long, glorious trip to Australia. At the time of the photograph, I could not know that I would get to come back again — three more times (so far). So for me, it was a sad view. However, I did return to Australia, and I shall shortly start on tales of those subsequent trips, though with a few interesting tales in between. One such tale is in regard to the name of the airport from which I was flying. Sydney’s Kingsford Smith Airport is named for one of Australia’s many aviation pioneers: Charles Kingsford Smith. Having served in the Royal Air Force during World War I, Kingsford Smith taught aviation after being wounded. However, it was after the war that Kingsford Smith gained international fame. Among his several remarkable feats of aviation, he was the first to cross the mid-Pacific Ocean by air. In October 1933, Kingsford Smith completed a solo flight from England to Australia in seven days and five hours, and in 1934 he flew with P.G. Taylor from Brisbane to San Francisco. Sadly, in 1935, Kingsford Smith and a companion disappeared during a flight from London to Australia. If you’re keen on aviation history or biographies of people who lead dramatic lives and helped change the world, you can go here to read more of Kingsford Smith. Shortly after my book, Waltzing Australia, went live for Kindle readers, Kindle Digital Publishing asked me if I’d consider giving them exclusive rights to the book for the next 90 days. So a version for other ereaders is being postponed. However, there is good news for Kindle owners who are also Amazon Prime members: you can check Waltzing Australia out of the Members Lending Library for free. For those of you who may have been holding off on buying my book until there was a Kindle version — the time is here. Waltzing Australia went live on Kindle a couple of days ago. You can find it listed on Amazon — a search turns it up right after the print version of the book. For anyone who has a different ebook device, I hope to have the book available on Smashwords soon, which means it would be available for most other ebook readers (including iPhones). So if you’ve got a Kindle, I’m ready for you now: here. (And be aware — even if you don’t own a Kindle device, you can download the Kindle software for free on your computer, and then just read Kindle books there.) For other devices — stay tuned.